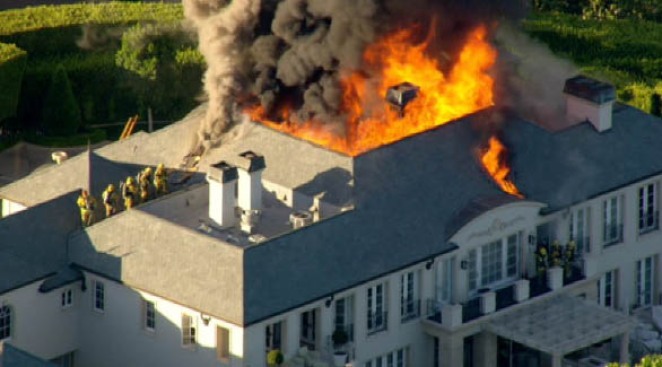 The Beverly Hills mansion that caught fire Friday evening, injuring a responding firefighter, was under major renovation after having been sold recently by Real Housewives of Beverly Hills star Laura Vanderpump, sources told NBC4 News. Vanderpump and Ken Todd sold the home for nearly $20 million last year, sources told NBC4 News. It is the location where her daughter was married, and the home can be seen in the opening credits and titles of the Bravo! show. "I feel sorry for the new owners. I mean, they paid a lot of money for it, let’s be honest, and now I don’t know. What is it, three years under construction? I mean, it’s a nightmare," Vanderpump said. About 120 firefighters put out the blaze that ripped through the mansion, fire officials said. One of the firefighters was injured when part of the ceiling collapsed on his head, officials said. He was transported to the hospital with minor injuries, officials said. "Possessions, houses, they can be replaced, you know, my heart goes out to the firefighter that was injured," Vanderpump said, adding that she chose not to watch the footage of the fire. The blaze in the 100 block of Beverly Park Way (map) was reported at about 6:30 p.m. and was reported knocked down shortly before 8 p.m., said Erik Scott with LAFD.